As you approach Stoney Littleton long barrow, it looks as though it is sliding down the side of a hill, and in this respect its situation is slightly unusual. Discovered in 1760 when the farmer-occupier broke into the chamber while trying to obtain stone for road mending, the site is one of the first long barrows in the Cotswold-Severn region to have been systematically explored. The incorporated ammonite counterpart. Image © Adam Stanford. Stoney Littleton Long Barrow entrance. Image © Adam Stanford. Stoney Littleton Long Barrow interior. Image © Adam Stanford. This happened on 24-25 May 1816 and involved the Revd John Skinner of Camerton, his brother Russell, Sir Richard Colt Hoare, his steward and surveyor John Crocker, and a labourer named Zebedee Western. Partly restored in 1858 and again in the late 1990s, the mound is neatly edged by a dry-stone wall that follows the original line and is not dissimilar in appearance to how it would have looked 5,500 years ago. Overall, the mound measures about 30m by 15m and is still nearly 3m high at the southeastern end. At the higher, wider, southeastern end there are two projecting horns flanking a forecourt, at the back of which is the entrance to the chamber. Immediately inside the entrance is a marked entrance area (sometimes referred to as the ‘vestibule’) defined by projecting jambs. 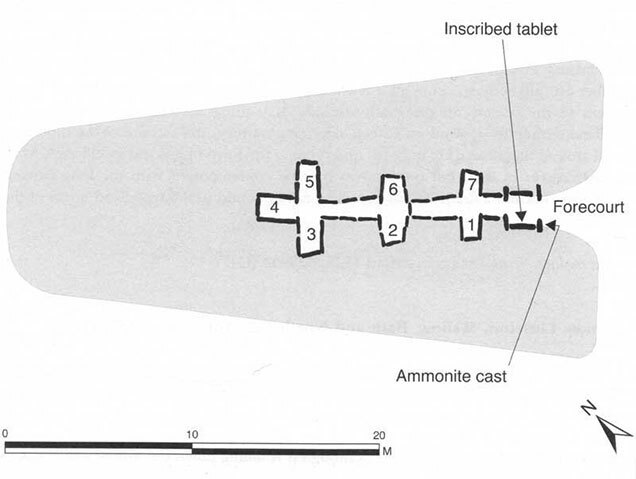 Section and Ground PLan of Stoney Littleton Long Barrow from the 1880-1881 Bristol and Gloucester Archaeological Society Proceedings. A passage, 13m in length, gives access to six side chambers, three on each side and an end chamber. Excavations in 1816 together with less systematic openings in 1760 and 1816 suggest that originally there were many individuals buried within the chambers, but exactly how many cannot now be determined. 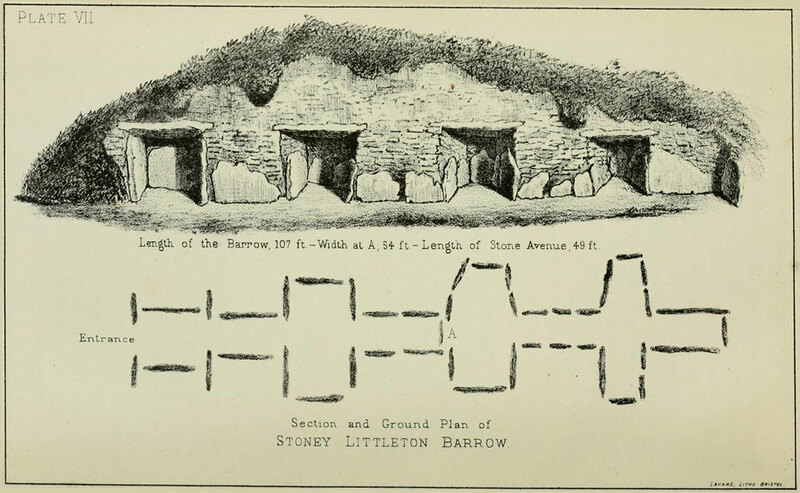 Stoney Littleton Long Barrow plan. Image by Vanessa Constant. The stones used to build the chamber and passage at Stoney Littleton were carefully chosen and some came from outcrops more than 8km away. Key things to look for at this site are: the walling and roof construction of the chambers; the ammonite fossil on the left-hand door jamb; and the fine tablet just inside the entrance which celebrates the reconstruction work carried out in 1858. ST 7349 5721. 7km S of Bath. Access across fields by footpath from a car-park at Stoney Littleton Farm, signposted from Peasedown St John on the A3 67. English Heritage. Finds in Bristol City Museum. Further reading: Colt Hoare 1821a; Bulleid 1941; Donovan 1977; Gnnsell 1982; Thomas 2003. I’m writing a small book on the neolithic of the Frome Area for the local historical society and I would like to use the Vanessa Constant plan along with the Gloucester Arch Soc. one. Would this be possible if duly credited?